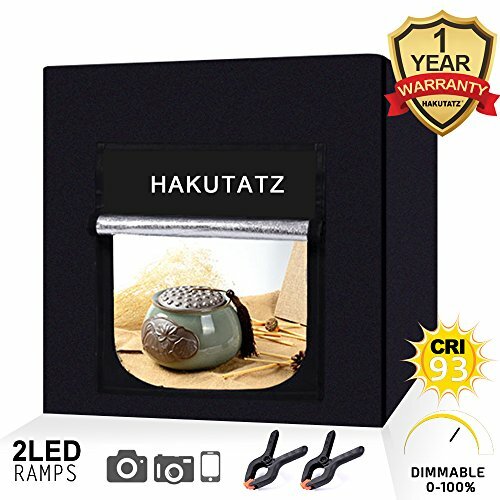 The 16"x16"/40cmx40cm Lighting Tent provides amateur and professional photographers with a simple method to quickly take excellent product photographs. The tent includes one integrated 60-LED light panels that provide bright, daylight balanced light. This light, combined with the silver reflective interior of the tent, provides even lighting to minimize shadows. The kit includes four backgrounds - Black, White, Blue and Green. The backgrounds are a smooth, plastic material so they can easily be wiped clean. High density white soft light without shade, easy to match with any background paper and camera. A convenient carry case is included for easy transport and storage. Perfect for items like Jewelry, toys, electronics, cosmetics and so on. One Large LED light panel which is on the top that provides bright White Lighting. Dimensions: 16"x16"/40x40cm. Note: the object for shooting shall not be bigger than 9.8"x9.8"/25x25cm. Output lights: Double 60 LEDs light bands, super bright to provide the adequate light source.High density white soft light without shade, easy to match with any background paper and camera. This light combined with the silver reflective interior of the tent, which provides even lighting to minimize shadows?your photo will be with pure white background and you don't even need to have the photo copped. Very easy to instal! No other tools needed for the installation and uninstallation. Space saving and very flexible. Can be utilized on various occasions or in different places. It comes with a carrying bag and 4 pieces of background paper boards ?Black, White, Blue and Green?, Perfect for items like Jewelry, toys, electronics, cosmetics etc.